Goa attractions are not just beach, sun, sand, sea, and booze. There are many other things which attract tourists to this small piece of land of India lying in the western side in Karnataka border. Many of the tourists who visit South India also prefer to spend at least 1-3 days of their vacation in Goa too. Goa is one of the top tourist destinations of India. More Goan attractions are national parks, hills, waterfalls, backwaters, historical places, churches, temples, forts, museums and markets. Goa , the former Portuguese province in India, is blessed with natural and man-made attractions which beckon tourists from around the world. Panaji, located on the banks of River Mandovi,is the capital city and Vasco da Gama is the largest city of Goa. Goa is divided into two districts - South Goa and North Goa. Most of the historical sites including churches and temples are in South Goa and more beaches are in North Goa. Goa's culture is an interesting amalgamation of both Eastern and Western styles. Goan cuisine is famous for its rich variety of fish dishes cooked with elaborate recipes. Coconuts, coconut oil, spices and vinegar are used in the cuisines widely. 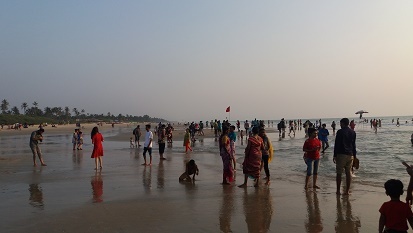 Calangute Beach - the largest beach in NG and known as the queen of beaches. Night life in Goa beaches are world famous. For spiritual explorations, Goa has Yoga, meditation, Reiki training etc. There are many churches in Goa. Among them, Basilica Bom Jesus is the most famous one. Basilica Bom Jesus, a UNESCO site, is the most famous church, and is located in South Goa. 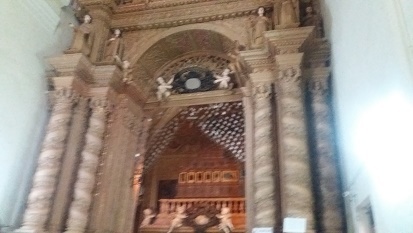 This church is dedicated to St.Francis Xavier. Se Cathedral is another major church, situated oppose to Basilica Bom Jesus. Fort Aquada - Constructed in 17th century, Fort Aquada is one of the main Goa tourist spots, visited by many. Goans, a harmonious blend of different cultures, celebrate a number of festivals every year. These are the main festivals. Food and Cultural festival is celebrated in November for five days. Feast of Three Kings is celebrated in January every year. Ganesh Chaturthi is celebrated in August-September and it lasts for 7-10 days. Sao Joao Festival, which is purely meant for sons-in-law, is celebrated in June.